What is a calle, anyway? When is a typewriter store a work of art? Ah, but it’s not really a store, and it’s not just any typewriter. It’s the Negozio Olivetti — and a pièce de resistance of architect Carlo Scarpa. This is the first article by a new contributor, Gioia Tiozzo. Gioia is a journalist, born in Venice and still living here. She’s interested in communication and the Internet, and would like others to know her city better; to that end she has established the web site 100x100venezia.it (in Italian for now, but scan her daily photo blog). Gioia is also interested in the concept of Venice as a water city, and given that water is an indispensable element of life, how important it is to have great respect for it. Gioia will be submitting articles of interest from time to time, with me translating them. When I received this first one on the recently-restored Negozio Olivetti, I ran right out and shot the photos. Welcome, Gioia! After years of closure and a 12-month restoration, the magnificent showplace for historic Olivetti office machines has returned to take its rightful place on the Piazza. Designed by renowned architect Carlo Scarpa (who also is responsible for the impeccable renovation in the basement of the Querini Stampalia), the Negozio is considered a masterpiece of modern art. Conceived in the ‘60s, it has never been a point of sale of typewriters and calculators, but rather the prestigious company’s elegant exhibition hall overlooking one of most beautiful and famous squares in the world. Closed in 1997, the following year Negozio sold tourist paraphernalia. But the restoration in 2010 supervised by the Superintendence for Architectural Heritage has restored all the property’s complex beauty, making it once again available for all to enjoy. Negozio Olivetti’s story began in 1958 when captain of industry Adriano Olivetti asked Scarpa, one of the greatest architects of the twentieth century, to create a space that would represent the Olivetti company and their products. The result is a space of linear perfection where light and elegance interact flawlessly. Marble, mosaic tiles, glass, water and wood are integrated so seamlessly that the entire space becomes a work of art in and of itself. The marble staircase that leads from the ground to the upper floor is today considered a symbol of Scarpa’s modern art; the colored glass mosaic floor a gesture of his abiding affection for the city. Reflections and transparencies create a sense of incredible volume to this long, narrow space just over 20 meters long and 5 meters wide. With the desire to open an exhibition venue in Venice, Adriano Olivetti was pioneering the idea of partnering art with industry, and therefore with sustainability. An art patron who called on Scarpa to embark on an artistic adventure managed to create what is today considered an important work of modern art. The idea of being an entrepreneur and investing in works of architecture able to leave a distinctive mark over time, was one of the elements that distinguished Adriano Olivetti. The Negozio Olivetti is on the “Quadri” side of the Piazza San Marco, toward the Correr. The property is owned by Assicurazioni Generali and has been loaned to the FAI (Fondo Ambiente Italiano, Italian Environmental Fund), who manages it through volunteer participation. 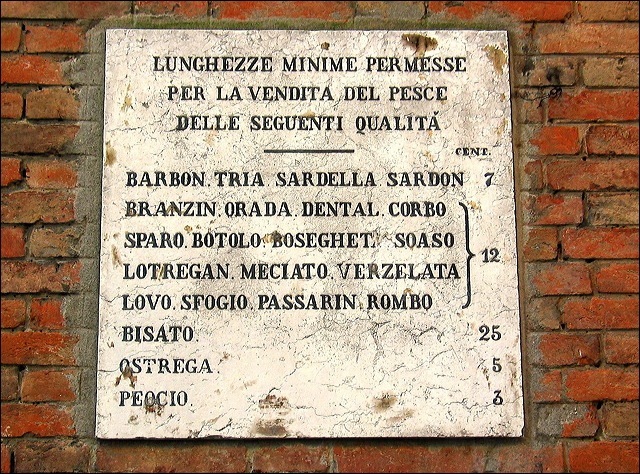 This entry was posted in About Venice, Sightseeing Venice, Venice Instructions on May 1, 2011 by Living Venice.